James Begley from Oshawa, Ontario, Canada. Is a multi-award winning, High Energy Elvis Entertainer that covers Elvis' entire career from the Rockin 50's, the Army/Movie years, the 68 comeback right to the Amazing Vegas Years. James portrays Elvis in an honest manner, paying close attention to the sound and movement that Elvis had in all his different eras as well as striving to recreate some of the breath taking excitement that Elvis caused while performing one of his more upbeat numbers. 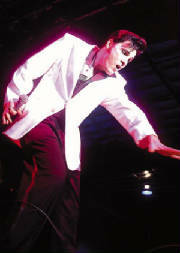 Although only paying tribute to Elvis for a short time, James has burst on to the Legends scene like no other. With his close resemblance to Elvis, his natural charm and charisma and of course his undeniable talent, James has quickly become one of the most sought after and busiest entertainers in the industry. James' love of Elvis began at a very early age. One of James' 1st memories as a child is seeing an old 50's looking mic set up in a church hall, James than proceeded to the mic to belt out the 1st verse of Heart Break Hotel. Like many Elvis Tribute Artist's, James owes his great love of Elvis to his mother who is just about the biggest Elvis Fan in the world and also an avid collector. James was just recently crowned the 1st Place Grand Prize winner at the Orillia Rock & Roll Festival & also the 1st Place Grand Prize winner at the Ottawa Elvis Festival. James has also now added the unique song styling of the great Buddy Holly to his act. James catches the remarkably unique sound and quirky charisma that Buddy had while putting on a Fantastic, highly entertaining show.